Squash and zucchini season has commenced! In about three weeks I’ll probably reach my saturation point but for now, I’m reveling in its essential “summerness.” There’s really no end to the recipes you can create with these versatile veggies. Think, ratatouille, zucchini bread, chilled soups, and gorgeous grills. It’s been mighty humid here of late so I’ve been loathe to fire up the stove or oven. In light of that, here’s a great no-cook recipe for a sultry summer evening. Enjoy this as-is or add sliced grilled chicken to round out the meal. The prosciutto is nice and salty so you shouldn’t need to add extra salt. Just finish the dish with cracked black pepper and baby basil leaves. So pretty, so tasty, and so refreshing. In a small measuring jug, combine the lemon juice, mustard, sugar, and oil. Whisk to combine. 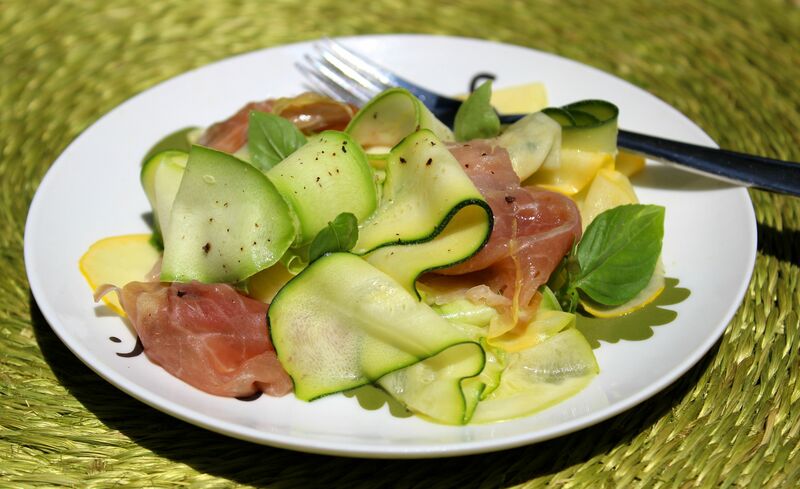 In a large bowl, combine the zucchini and squash slices and the prosciutto. Drizzle over the dressing and toss to coat. Sprinkle over basil leaves and pepper and serve. *I used my trusty Japanese mandoline for these thin slices. This entry was posted in lunch, main, salad, side and tagged basil, lemon dressing, no-cook, salad, squash, zucchini. Bookmark the permalink. Hey thanks Jennifer! I’m on my way to check out your blog!